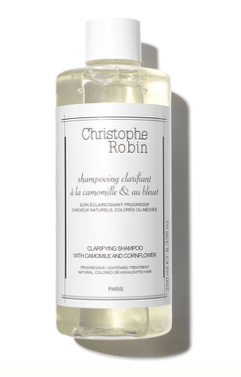 Skimming across the internet off the back of your enthusiasm for the Lush solid shampoo post, I have also sourced another one, by top French hair-fancier Christophe Robin. Yes I KNOW, that is really his name. This one is called the Hydrating Shampoo Bar with Aloe Vera. It comes in a neat little cardboard box, containing a palm-sized block, about 2inches by 3inches and smells sweet and creamy with a hint of citrus. 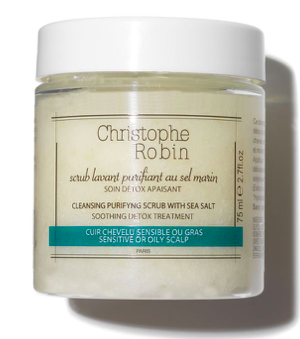 What it doesn’t have is any paraben, silicones or SLS. The SLS (sodium lauryl sulphate) is a thing that irritates some people’s scalp. It is quite niche, this product. It is not quite a like-for-like replacement for a normal shampoo. Because it is so chemical-free it doesn’t do exactly what other shampoos do and it does leave a residue. BUT, this isn’t necessarily a bad thing; if your hair is fine or flyaway or sort of slithery and lacks hold and texture, this is kind of exactly what you need. 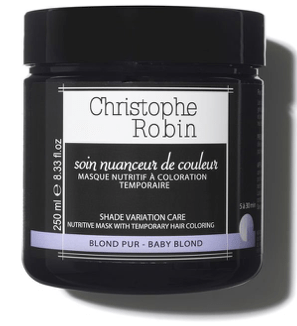 It gives you cool “dirty” hair, like – well, like a French girl – without your hair actually looking dirty. It definitely feels a tiny bit lived-in, but looks pretty awesome. If a bedhead effect is what you’re after and SLS brings you out in hives, you could do worse than this. I was sent a few products from the rest of the range and they are, also, unusual, effective and interesting. I feel confident that you could, if you were looking to invest a bit in your hair, try out some of this range. I think that scalp scrubs generally are a good thing, (I like mine from goop a lot), and CR has a faintly Satanic-sounding one here – this one comes in a tub and smells like… I don’t know, I don’t know how to describe it. Wonderful. Exotic. French. Expensive. There are actual chunks of rock salt in this, which clatter to the bottom of the shower as you wash it out, making it sound like you’re in the middle of a hailstorm. But it sure as hell gets your hair clean. The Shade Variation care range is incredibly popular – I have got one for redheads and am keen to use it; I rather miss my original colour, having messed about with bleach so much over the years. You will possibly want the one for blondes. It comes out a frightening peacock blue colour, which a lot of blonde-correcting shampoos do, and has rave reviews. 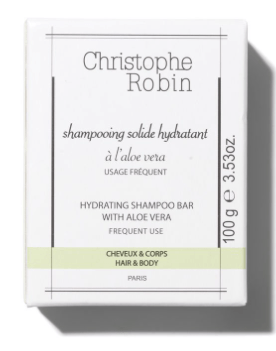 Here is a bestseller – a clarifying shampoo for anyone who isn’t on a solid-only mission. 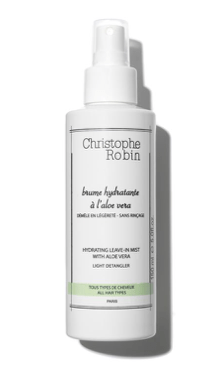 The Hydrating Leave-In Mist with Aloe Vera was the winner of the 2018 Glamour Beauty Awards, which is for you if your hair is a bit Debbie Harry and you’d like it a bit more Kate Middleton. This cleansing mask is another one for over-treated hair, which is the sort of thing that even I use on my hair once in a while – and I treat my hair like total crap. Love the sound of these products – especially the sea salt scalp scrub 😛 But £42 for a shampoo!! 😱 Quell horreur. Have also recently chanced upon SFS-free range Living Naturally (https://www.soapnuts.co.uk) which has some interesting sounding haircare for under a tenner. Will give that a go until I win the lottery…. I have tried a couple of things from his range. I can highly recommend his chestnut hair colour mask, and the volumising spray . The shampoos and conditioners are nice, not worth the money though.